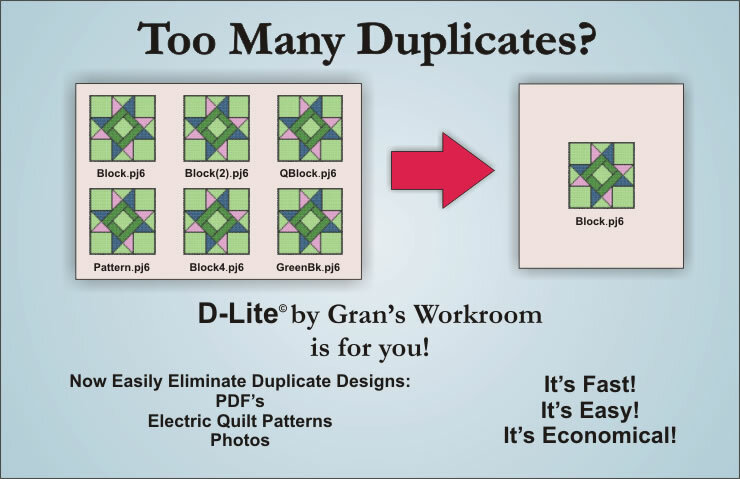 Gran's Workroom D-Lite is your AFFORDABLE solution! The Embroidery Deduper D-Lite© is the FASTEST and EASIEST solution to eliminate duplicate files. It's great for quilters, photographers, music enthusiasts and everyone else that just needs to clean up their files! Automatically scans your file folders and detects and removes duplicate files. Just choose your file folders and start it! Identifies duplicate files even if the filenames are different. You can choose whether to prompt you before deleting the duplicates or move the duplicates to a separate folder. Preference settings can be saved on a per-project basis. It's Fast! The Embroidery Deduper D-Lite © can process thousands of files in a matter of seconds. Speeds exceeding 200 files / second are not uncommon, depending on your system configuration and duplicate file density. Drag and Drop capability. Simply set your preferences, drag the folder you want to clean up and drop it into the Embroidery Deduper D-Lite © window, press the "Begin Dedup!" button and you're off! It's that simple! You can save the project to a project file, making it even simpler in the future! The Embroidery Deduper D-Lite © is the fastest and most thorough way to tidy up your folders. Don't forget! If you are a machine embroiderer, you can clean up your designs even more thoroughly by purchasing our full version of the Embroidery Deduper! To learn more, go to http://www.gransworkroom.com/software.php !